Have you ever searched for your business online? If you did, what did you find? Were you surprised or did you find nothing at all? Is it consistent or is each mention of your business different? Knowing what your business looks like to those in search of a product or service is important to understanding what you need to do to market your business effectively. Before you can develop a practical inbound marketing plan for your business, you need to know how your business is viewed when someone searches for your products and services. Our web presence analysis service is a comprehensive review of the digital footprint for your business. It includes a review of your website, content organization and optimization, social media profiles, Google My Business and local SEO, directory and citation review and an assessment of your overall online presence. The purpose of this program is to review the effectiveness of your complete online presence in communicating the company’s message and brand. A successful digital strategy must be carefully designed and built on a solid foundation that will drive quality inbound leads. 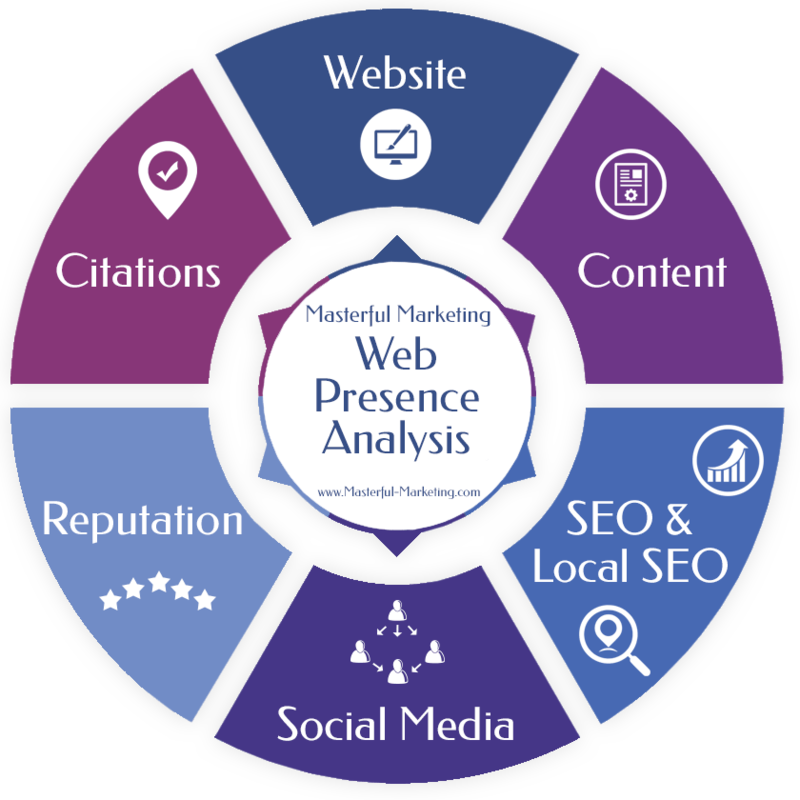 This comprehensive web presence analysis will create the foundation that will help your digital marketing activities succeed. Complete website audit including performance, mobile friendliness and user experience. We also alert you to any technical issues and security risks. Content audit including content organization. Search Engine Optimization (SEO) including on-page optimization, structured data and back links. Local citation audit including Google My Business listing and your presence on online directories such as YellowPages and Yelp. We will schedule a one-hour Zoom meeting with you to present the results. We record our meeting so you can listen to the results without having to take notes and then review the details at your convenience. Before you can determine what type of marketing help you need, you need to establish a baseline of information showing you what you do well and what needs improvement. The results of this analysis will get your digital marketing strategy on the right track. All you have to do is fill out the form to the right and we’ll schedule a brief call to gather some information to get us started. Ready to Become More Visible?